UPDATED: Wed., Feb. 6, 2019, 5:39 p.m.
PIEDRAS NEGRAS, Mexico – A caravan of 1,600 Central American migrants is surrounded by Mexican authorities in an old factory a short distance from Texas, where they hope to seek asylum but appear to have a faint chance. The migrants arrived on buses Monday in Piedras Negras, Mexico, across the Rio Grande from Eagle Pass, Texas. The caravan is the first in recent months to head toward Texas instead of California. President Donald Trump in his State of the Union speech Tuesday night accused Mexican cities of busing migrants to the border “to bring them up to our country in areas where there is little border protection.” U.S. Customs and Border Protection has bolstered staffing and conducted exercises with officers in riot gear, and the Defense Department said Wednesday that it would send 250 soldiers to Eagle Pass in a support capacity. 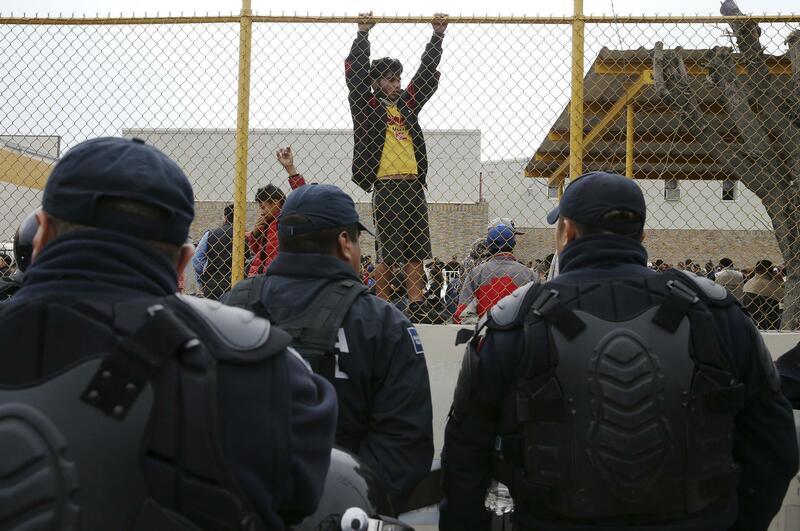 But the Mexican police and soldiers already have tightly controlled the factory where the migrants are being held. Migrants were not allowed to stay anywhere else. The government of the northern border state of Coahuila said it organized 49 buses from the interior cities of Saltillo and Arteaga to ensure the migrants’ safety. Coahuila has long been plagued by the now-fragmented Zetas cartel as well as by cold weather. “These types of caravans have been victims of organized crime groups that try to force the migrants to work for them,” said Jose Maria Fraustro, the state’s interior secretary. The San Antonio Express-News reported that migrants who tried to climb a 12-foot fence Monday night and escape were pushed back. Long lines were forming inside the factory of people applying for “humanitarian visas” to allow them to leave the enclosure but remain in Mexico, the newspaper reported. Meanwhile, the factory’s rooms have been turned into sleeping areas divided by age and gender, with blue foam mattresses, the Express-News said. They may have to wait weeks, if not months, to request asylum. According to Mexican officials , customs officials in Eagle Pass process 12 to 15 applications a day. A spokesman for U.S. Customs and Border Protection did not immediately respond to a request to confirm those numbers, but asylum seekers across the U.S.-Mexico border report being turned away or forced to wait in informal queues to see a customs officer. The U.S. Department of Homeland Security has started implementing a plan requiring all asylum seekers at the southern border to remain in Mexico. On the Texas side, a long line of law enforcement vehicles was guarding the U.S. side of the Rio Grande to catch anyone trying to cross illegally. Congressional Democrats have not acceded to Trump’s demand for $5.7 billion to build new sections of border wall. DHS in December released a list of where it would want to build new sections of border wall if Congress provided $5 billion. The list included 159 miles (256 kilometers) in Texas, but none in the Border Patrol’s Del Rio sector, where Eagle Pass is located. Published: Feb. 6, 2019, 12:06 p.m. Updated: Feb. 6, 2019, 5:39 p.m.